Maybe you’re heard of Pacha and her magical pajamas that take her around the world on adventures when she goes to sleep? Even if you haven’t heard of this endearing children’s character and her books, you’ll adore the message of global connectedness behind it. And now, the creators are set on bringing the magical pajamas to life by creating the world’s first augmented reality PJs – Pachamas. By combining the organic and fair trade cotton PJs with a mobile app and the books, children and their parents can bring the stories to life and find more meaningful moments together at bedtime. As the books go, Pacha, a 9-year old Latin-American girl, has these magical pajamas that whisk her off to imaginary worlds when she goes to sleep. There she learns about herself and goes on adventures with the comical animals featured on her PJs. In the first book she travels to a jungle and organizes and ‘epic music festival’ – all in her sleep! If only these magical PJs came in adult sizes and could really accomplish that much in real life while we were asleep. But Pacha is truly an inspiration to kids and the books and albums, aided by artists like Cheech Marin and Mos Def, have received a number accolades and are connecting kids to nature and the global community. The company behind Pacha, Balance Edutainment, has a goal to create “nutritious children’s entertainment” that uses technology to tell positive stories and empower kids. 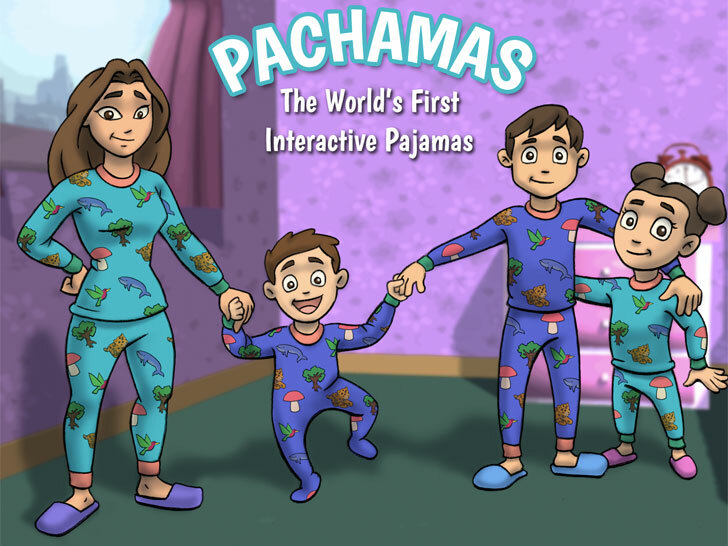 The company has recently launched a Kickstarter campaign to raise funds to produce the Pachamas, the world’s first augmented reality PJs. Made from organic and fair trade cotton, the PJ’s feature all the characters from the books. When coupled with the interactive mobile app, kids can hover on one of the images on their PJs and bring the character to life with AR. The app also works with the book and that trading cards and all further push Pacha’s mission – to boost self-awareness, ignite the imagination, and reconnect to nature. Maybe you're heard of Pacha and her magical pajamas that take her around the world on adventures when she goes to sleep? Even if you haven't heard of this endearing children's character and her books, you'll adore the message of global connectedness behind it. And now, the creators are set on bringing the magical pajamas to life by creating the world's first augmented reality PJs - Pachamas. By combining the organic and fair trade cotton PJs with a mobile app and the books, children and their parents can bring the stories to life and find more meaningful moments together at bedtime.